I know, really...A month! A month since I last wrote something. I should be ashamed and really it's the procrastinator in me that I can blame. So much going on, so little time...Yes, tomorrow I will blog..I promise...well, as we can see...THAT didn't happen much at all this month! SO, here's a little recap! St. Baldricks! We were fortunate enough to be involved in this first annual Saint James, St. Baldricks head shaving extravaganza! There were 4 of us Bijou girls and two other hairdressers from other local salons. It was a great feeling to be able to network with other salons, this should really be done more often! 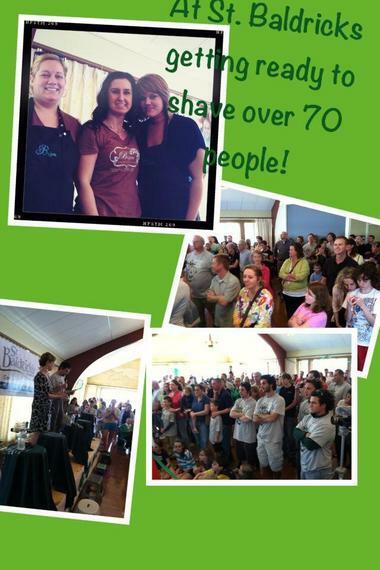 We shaved over 70 heads, men and women, boys and girls! It was really...amazing seems like such a small word, it was impressive seeing everyone come together to support childhood cancer. The kids involved, listening to the parents talk. Kids are always the bravest. We were so honored to be a part of it, and we loved it so much that another group of Bijou girls will be doing the same thing in Auburn at the fire department! Such warmhearted girls, love those Bijou girls! Here are some articles about it to read. Click here and here! 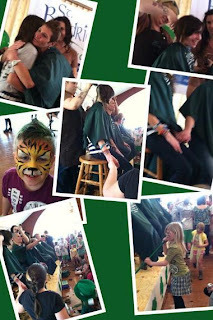 FYI, they weren't messing around, for their first time participating in St. Baldricks, they raised over 27k! We were thrilled to be a part of it! At the end of the month, Courtney and Kim traveled on an adventure to Bumble and bumble!! For 4 days of learning how to network educate within our salon, we now have been fully trained in teaching classes to the girls at the salon. This was the most challenging four days in quite a long time, classes began promptly at 8:30 am and lasted till 5:30 pm. The day was jam packed and we learned so much. I find Bb University to be such a nurturing learning environment. They realize that people all learn in different ways, listening, seeing and experiencing. So they have us learn all three ways. It's quite interesting and I truly think it's a wonderful experience!! We were challenged with live models and they watched our every move, which is great to get such hands on learning experience with so much feedback! Our other fun thing we have to share is two of our very talented clients have just begun a CSA garden! What is a “CSA”? It is Community Supported Agriculture. A CSA is a community of individuals who pledge to support a farming operation where the growers and consumers share the risks and benefits of food production. CSAs usually consist of a system of weekly delivery or pick-up of vegetables and fruit, in a vegetable box scheme, where what is grown is split up among the CSA members. Each member purchases a part of all of a “share”. We have half or full shares available, and, you can choose a “Veggie share” or a “Spicy share”. I've already secured my half share for my family and this will ensure that my family will once a week get a little bounty of veggies that are grown on a farm by people that I know are not putting chemicals all over them! They are growing them with love and I cannot wait to get those veggies. You can see their webpage - about us page that tells you all about them here! But look here too! Go to facebook and watch out for the random questions I post every couple of days, if you comment, I'll add your name! You can do this as many times as you like! Leave a comment on our blog, I'll add your name to the raffle jar! Come into the salon and take a Marigold Farm business card and ask to enter your name! My next project getting the newsletter done with our April Specials! !